Heikin-Ashi Candlesticks Scans & Charts are now available! 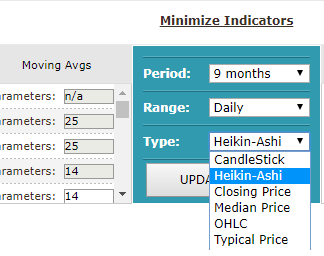 Heikin-Ashi Candlesticks are now available in our Charts & Screener. It can be added for Intraday, daily, weekly & monthly ranges. Thanks for giving Heikin-Ashi candlesticks !!! Great work Chartink team…!!!!!!!!!!!!!!!!!!!! With bottom of my heart Once again thanks to chartink website….!!! You guys are really awesome. Can you please let me know if i can scan ema cross over using Heikin-Ashi candles. I am looking for 20ema cross over above 50 ema in 5 mins Heikin-Ashi candles. I’m requesting to add candlestick zoom in, zoom out and to view clear past candlesticks for better learning in free/premium.. When will be BSE & X group Stocks available in scan, anyhow next week i’m glad to subscribe Yearly plan !! ADX, +DI & -DI scans are not working correctly. It shows results with stocks where ADX/DI values don’t match the conditions. Above scan is supposed to show stocks with +DI values between 35 and 37 on 5 min charts. But it is giving Castrolind & INDIGO as results. Both of which +DI values are less than 29 as of now (market close 13-Mar-18). Same thing happens with any TF on ADX scans. Please let me know if this is an error, or I am doing something wrong? Excellent work by Chartink team for the scanner. If possible please add logical operators too(AND,OR,NOT)in the scanner. How to apply stochastic on heikiashi candle. Is it possible? I am new user I am unable to zoom the chart screen. can you help me how I can zoom it any key is there? Yes, Currently we do not have this feature. We do plan on adding the zoom in feature in the near term. Shall keep you posted. I am a premium member and facing problem that chartink.com is not showing chart at all. Will you help me over phone. Zooming of candles are required for 1min candle. Presently 1 Minute candles cannot be watched closely. I am having premium membership. Please provide minimise indicator period to either 0.25 days or less from 1 day. This is very much required for 1 minute analysis. Presently candles are very close to each other and I am unable to analyse at all. Yes, we do plan on adding the zoom in feature in the near term. Shall keep you posted. I have paid for premium subscription. Chart updates are not updated lively as per my experience. The delay time varies from 5 min to 15 minutes. Which will be very difficult for intraday trading..
Can you please explain how to overcome this issue to get lively updates.